The mid-century novelist Theodora Keogh’s disappearance from the popular consciousness demonstrates the difference between books and literature, best-sellers and perennial favorites. Popular fiction – and nonfiction, for that matter – is rarely classic fiction. For every John Updike or Cormac McCarthy, there are dozens of Taylor Caldwells and Cynthia Freemans whose books, for better or for worse, sell well during their era, but are largely forgotten within just a few years. The fact that these books slowly fade from our literary memory is not necessarily an indictment of their quality (although in many cases, it is). Rather, it’s the confluence of several factors: a style that falls from popularity, an author whose momentum is lost, or a subject that seems dated within several years of publication. Ah, you know Marge’s contempt does not bode well. After all, you’ve read Harold Robbins and Jacqueline Susann, so you know that a hard nut like Marge is never going to coming to any good. Despite, or perhaps because of, the lurid nature of many of Keogh’s books, the author is going through a renaissance of sorts right now. For some inexplicable reason, all of her books are available on Amazon in ebook format for $1.00 each. There’s a schizophrenic quality to Keogh’s printed output that makes it easy to see why her best fiction was neglected, while the freak-show pulp books fell by the wayside. 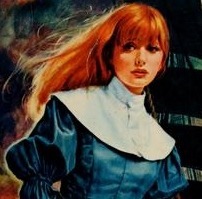 Keogh writes with a strange, sometimes uncomfortable intensity; an everyday exchange between two young girls in Meg takes on huge proportions, while in the excerpt above from The Other Girl, Marge establishes herself as a less-than sympathetic narrator within the first chapter through her contempt and coldness toward other women. In the best of Keogh’s books, such as Meg and Street Music, this quality in her writing makes for indelible portraits of ordinary people in bizarre circumstances. But this quality lends itself all too well to the type of pulpy sensationalism that Keogh often wrote, like The Other Girl, The Mistress and The Double Door. Because Keogh was an artist of her type, the line is sometimes so blurred, the veering between ugliness that’s real and ugliness for ugliness’ sake so whiplash-inducing, that she produced a couple books that are either genius or pure trash — The Fascinator is one of these. Ostensibly the story of a rich New York housewife who falls in love with the Fascinator of the title, a famous sculptor (named Zanic, no less), The Fascinator could almost be a companion piece to The Feminine Mystique, so striking is the similarity between Ellen, the protagonist, and Betty Friedan’s middle class housewives consumed by their ennui. Yet it wouldn’t be a Keogh book if there weren’t disturbing, predatory elements to Zanic that sometimes push the book into pulp territory. In this way, it’s almost an inspiration to The Feminine Mystique, predating that book by ten years (The Fascinator was published in 1954), and unwittingly giving Friedan a cautionary tale for all the bored women whose good educations and bright imaginations have led them into adultery and dissolution rather than careers or creativity. Keogh authored only a handful of books between the publication of Meg in 1950 and her final book, The Other Girl in 1962. While it’s doubtful that her rediscovery and republication in e-book format will vaunt her books into the American literary canon, Keogh is nonetheless worth reading. 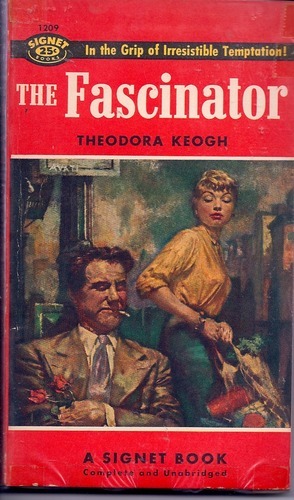 Categories: E-books, Literature, Paperbacks, Rediscovered, Reviews | Tags: Meg, Pulp Fiction, The Fascinator, Theodora Keogh | Permalink.